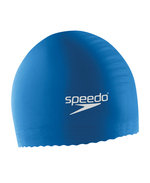 Our #1 best selling swim cap. Provides more stretch and overall durablity. Ribbed edge keeps cap from slipping. Import.